Update (3:12 p.m. EST) -- See below for our answers to some of the most popular questions we've received so far, and find out what the Ocean Medallion really means for cruise passengers, as we report live from its official reveal. (January 3, 12:05 a.m. EST) -- What will the cruise of the future look like? According to Carnival Corporation, it will be as easy as a wave of your wrist. 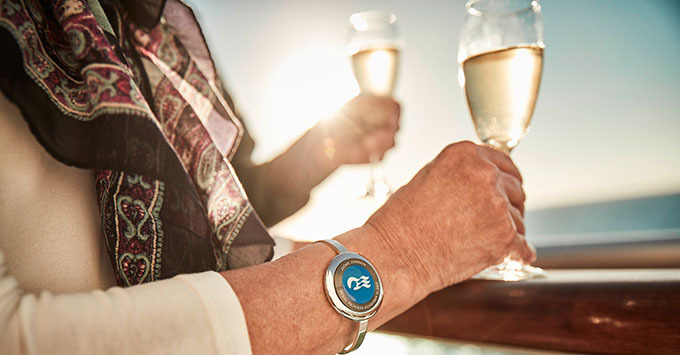 Wearable technology -- essentially a virtual concierge that can do everything from delivering food to any part of the ship to suggesting and booking shore excursions -- called the Ocean Medallion will come to the Carnival Corporation fleet in 2017. In a first for the travel world, Carnival Corporation CEO Arnold Donald will reveal the details tomorrow at a keynote speech from CES 2017, the global electronics and consumer technology trade show in Las Vegas. How does it work? It begins with the medallion itself, a small disk that will be sent to every passenger before he or she leaves home. Tiny in size and massive in ability, the 1.8-ounce Ocean Medallion is the shape of a quarter and stores the information that travelers provide -- not just online before the trip but also in real time as the device is powered through another creation, the company's Ocean Compass digital concierge. You can wear the Medallion around your wrist (like an Apple Watch), around your neck (like a pendant) or just carry it in your pocket. Benefits of Ocean Medallion include streamlined embarkation and debarkation, the ability to locate friends and family throughout the ship, better interactions with crew members who also will have devices and easier ways to access dining and entertainment throughout the cruise. Carnival Corporation's Princess Cruises will be the company's first cruise line to adopt the new technology later this year. Ships that are outfitted with the technology will be classified as Medallion Class Ocean Vacations. Passengers going on these cruises will create personal profiles before their vacations, filling out preferences around hobbies like gaming or the culinary arts, as well as lifestyle choices, such as recreational and entertainment preferences. Streamline Embarkation and Debarkation: With the device, port embarkation and debarkation are streamlined. Travelers using cruise line transfers will be met at the airport's baggage carousel and be greeted by name. Their luggage, once properly identified, will be delivered straight to their cabins, avoiding the hassles typically encountered at the port terminal. Those who've signed up at home can simply board the ship; the Ocean Medallion will have all the info needed. There's no waiting in line to buy beverage packages, make restaurant reservations or check out shore excursions. If you haven't already chosen your options, customer service and shore excursion staffers will be milling about the terminal, iPads in hand, able to accommodate requests. Offer Purchase Access: You can shop for products, shore excursions, spa treatments, photos and the like from any device you've registered -- even after the cruise ends. Personalize Dining: Checking out menus from personal devices is a convenience, but even better, the Ocean Medallion lets you place orders for delivery to anywhere you plan to be, whether it's poolside, your cabin, the ship's theater or the casino. (Charges might apply for food and drink.) The Medallion makes it easy to communicate dietary restrictions -- which you can do ahead of your cruise -- just once, and chefs at restaurants across the vessel will all have the info, wherever and whenever you're dining. 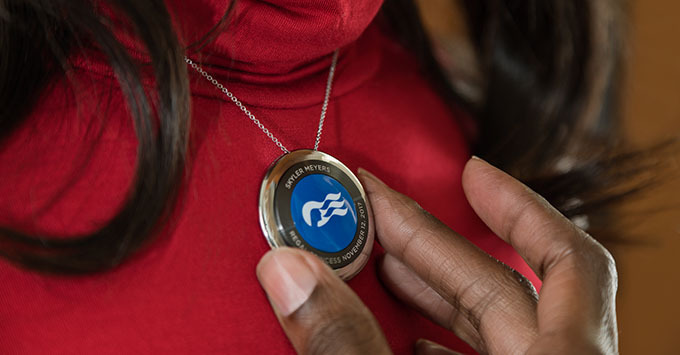 Enrich Service: Crew members will have access to their version of the Ocean Medallion/Ocean Concierge and can readily identify you and your preferences when the technology connects you together. For those who fear yet another gizmo, no worries, as there's no discernible technology on the Ocean Medallion: no on or off button, no need to charge it, no menu to navigate. Wearing the medallion, you can access the Ocean Compass digital concierge via smart phones, tablets and laptops. 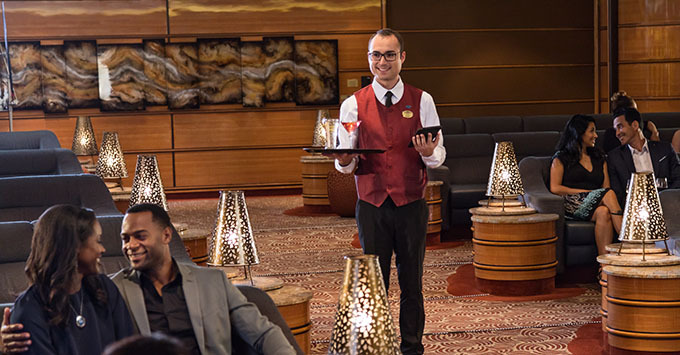 Those who prefer to stay off their personal devices on vacation can access their concierge through in-cabin televisions, digital kiosks in designated port terminals and on interactive screens positioned throughout the ships. All participating ships, which for now have been designated as Princess Cruises' Royal Princess, Regal Princess and Caribbean Princess, will undergo massive revamping from bow to stern to install a massive network of sensors and experiential computing devices. These will enable the Ocean Medallion and Ocean Concierge to interact as each passenger moves around the ship. "The Ocean Medallion creates an elevated level of service that's made possible by technology but doesn't feel like technology," says John Padgett, chief experience and innovation officer for Carnival Corporation, who led the team that created it. "Whether guests are ... having a drink delivered poolside or trying their luck gaming while lounging ... we are engaging with them in a personal way. Our mission is to help our guests make the most out of every minute of their vacation." Wi-Fi will also be substantially improved on vessels with the Ocean Medallion. And there's another plus: The medallion system does not use data or roaming packages. The system is local, so there are no extra fees involved with using personal devices, as long as they're part of the network. In addition to the ships themselves, private island ports like Princess Cays and Half Moon Cay will be wired, as will Port Everglades cruise terminal and dedicated spots at Fort Lauderdale-Hollywood International Airport. Does some of this sound familiar? Anyone who has used Royal Caribbean's Wow Bands, which operate on RFID (via radio waves) technology, will notice that the Ocean Medallion performs a few of the tasks that WoW Bands do, such as opening cabin doors and paying for onboard purchases. The difference is that the Ocean Medallion goes beyond serving as a keycard or as a vehicle to your shipboard account. It acts more personally and intuitively, alerting a wine-lover, for example, that there's a tasting going on. After Medallion Class Ocean Vacations debuts in November on Princess Cruises' Regal Princess, it will expand to Royal Princess and Caribbean Princess in early 2018. Ultimately, the plan, according to Donald, is to utilize the technology on other fleets in the Carnival Corporation family, which include Carnival, Holland America, Cunard, Seabourn, Costa, P&O U.K. and P&O Australia. Details will continue to emerge throughout 2017, and we'll keep you posted along the way. Have questions? Post them in comments below, or join in on the discussion on our Cruise Critic forums. The medallion is free to all passengers and comes with a plastic band to wear on your wrist. You can purchase additional accessories that will display your medallion as a watch, necklace or keychain. Additionally, there is no extra cost for Medallion Class cruises. Are they mandatory for all passengers? Anyone who wants to forego the medallion and concierge for a key card can absolutely do so. The medallion itself doesn’t store any data, and it never transmits or broadcasts anything. Think of it as a license plate for the individual, and that license plate is encrypted. Even if someone could break the encryption they’d get a number that is meaningless. Your information is saved on the Carnival Corp. system, much like any other cruise. While using the medallion, a crew member on the other side of the transaction can verify your identity as your security photo appears on their device. I'm traveling in a group. Can we use the medallion to track each other's whereabouts? The medallion is not a GPS system; however, cruisers can select an option that allows them to locate their travel companions via the medallion on their smartphone or kiosks throughout the ship. While the medallion is metal, you will receive a complimentary plastic band in the box with your medallion. You can purchase additional accessories that will turn your medallion into a watch or pendant, which will keep the metal from touching your skin. Can the medallion track passengers off the ship? The medallion uses scensor-based technology, meaning it is designed to work wherever wired scensoring is in place (on Medallion Class ships). Eventually, some private islands as well as Port Everglades and Fort Lauderdale-Hollywood International Airport will be outfitted with the technology to extend the service to land.